The Irish Cultural and Heritage Center is the home of a number of Milwaukee and Wisconsin based Irish and Celtic organizations. We are located at 2133 West Wisconsin Avenue, Milwaukee, WI 53233, near downtown Milwaukee. 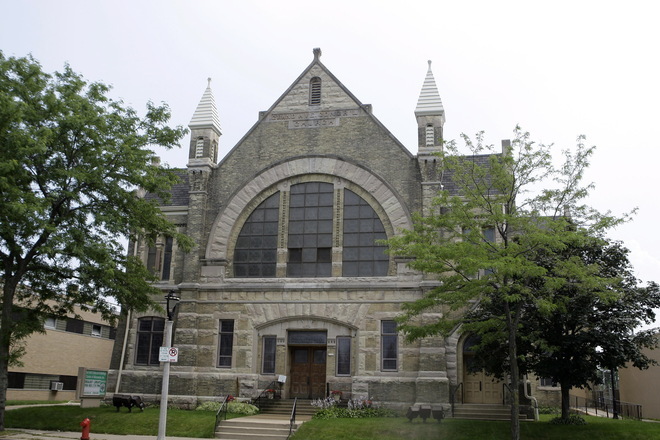 The Irish Cultural and Heritage Center is housed in the historic former Grand Avenue Congregational Church, a 110 year old building. The Irish Cultural and Heritage Center is located just north of the 22nd and 26th Street exits of I-94. Irish Fest is more than the world's largest and best Irish festival. At the lakefront Henry Maier festival grounds Irish Fest offers you outstanding Irish music, dance, food and cultural exhibits. There are activities the year around at the Irish Fest Foundation at 1532 Wauwatosa Ave. [North 76th Street] Milwaukee, WI 53213-2623. The Shamrock Club is the oldest and largest Irish American organization in the State of Wisconsin. It was founded on March 17, 1960, in Milwaukee. Currently, there are chapters in Milwaukee, Rock County, South Central, Dane County, New London, and Lafayette County. Statewide chapters hold monthly meetings, organize St. Patrick's Day parades, change the city of New London to New Dublin for the week, raise the flag over the State Capitol, as well as other Irish related activities. All of our chapters are involved in fund-raising and have donated thousands of dollars to numerous causes in the past four decades. Membership includes the printed version of their monthly publication, the Emerald Reflections.